What is the ideal blood sugar level for diabetics? Is there any ideal blood sugar level or range for diabetics? I know that as a diabetic, you would be very interested in knowing your ideal sugar level. Even in case you might not be a diabetic, you may still want to know about the ideal blood sugar range and how to keep yourself away from diabetes onset. In general, if you keep your blood sugar level below 100 mg/dl and higher than 80 mg/dl, this is considered as ideal range. Before performing a lab test, you should have been fasting for at least 8 hours prior going to lab. If the test results below 100 mg/dl, then it is considered normal reading. But, if it's 100-125 mg/dl, it's considered prediabetes; while higher than 126 mg/dl is considered diabetes. Convert: "mg/dl" to "mmol/l" Convert: "mmol/l" to "mg/dl"
On the other hand, you must watch how fast your blood sugar is raising up. So, if you take too many carbohydrates or refined sugars , your blood sugar level will spike very fast after meal. What you can do in this case is to monitor the carbs you intake. Whole grains and unrefined flours and sugars would be your best choice. Meanwhile, exercise and other natural lifestyle changes would give you a useful hand. Still find it difficult to manage your blood sugar levels ideally? Click here to get a more specialized help. 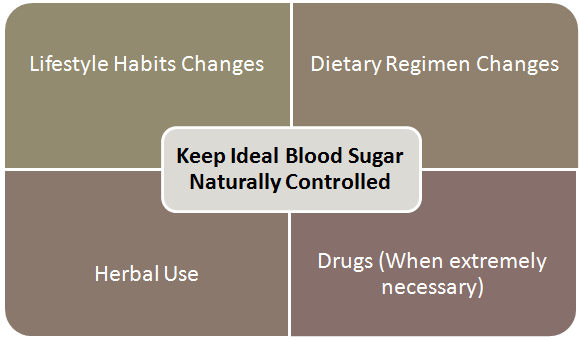 How to keep ideal blood sugar level naturally controlled? The first thing you should do is to educate yourself on diabetes, and how you can control it naturally. You may also consider some radical changes in your lifestyle habits. As a diabetic, you should train yourself in quitting the bad habits and customize good lifestyle habits to keep your diabetes under control. On the other hand, there exist some natural herbs for diabetes, which have been used since ancient times, and they've shown to help in keeping blood sugar under control. However, it is a must that you never quit taking your diabetes pills although you might be facing any side effect. Consult your doctor for everything in any case. Do I need to take any more drugs after I use the natural remedies? Once you decide to take these natural herbs, please inform your doctor. Because, once you take them, you might face drops in blood sugar levels that will need a reduction in your drugs dosage. However, only your doctor will make the decision as he/she knows better your medical history that nobody knows (neither do we). List of natural remedies for diabetes. The complete list of all these natural herbs, how to use them and what are their way of action, you can find at this Free E-book . If you want to get these herbs all in one, click here to discover this natural alternative. Don't forget to consult your physician for any step you decide to take. He/she knows better your health situation, and will give more precise instructions related to your case.